Parking: Free parking is available in the shopping plaza lot. Computers: Four internet computers are available. An AWE computer for children is also available. All users may have two half-hour sessions per day. Headphones are not provided. Earbuds are available at the Circulation desk for $1. 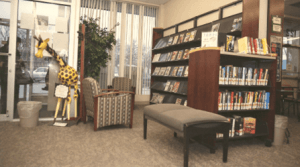 The East Forest Park Branch Library was officially opened in April of 2000. Neighborhood groups had been asking for a branch in the East Forest Park section of Springfield since the early 1950s. A former video store was creatively redecorated into a beautiful library branch located in a mini mall with free parking and is fully handicapped accessible. Visit the Promised Realized page to learn more about the Capital Campaign and how you can help!